Ship Shape Elementary: Today I saw a giant stuffed bear! 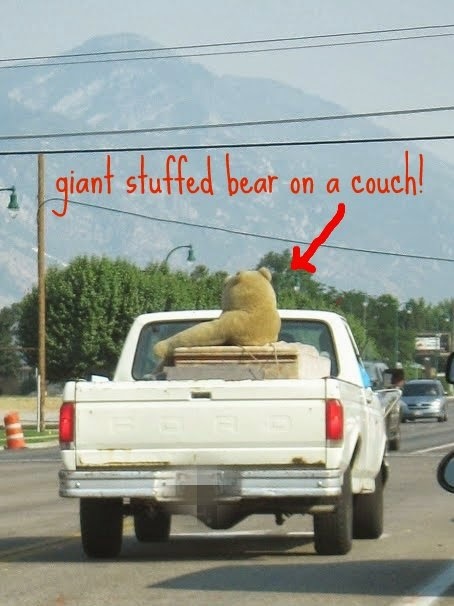 Today I saw a giant stuffed bear! I had the most vivid dream last night. It was one of those disconcerting dreams that happen now and then and kind of make you roll around and moan in your sleep. It was about...bulletin boards. Ha, stupid right? It gets worse. In the dream my life depended on whether or not I could create the perfect bulletin board. Yah...I think I need to do something about my subconscious' obsession with perfection. Or watch what I eat before bed. I've mentioned before how much I love bulletin boards and how it just makes me happy to staple up pieces of cute fabric and borders and then fill it all up with happy learning doodads. So...after a quick trip to Hobby Lobby and my local teacher supply store I went in to school and put up a few boards! They may not quite be perfection...but I like the way they turned out and I'm pretty sure my life doesn't depend too much on it! Now I just need to fill them up with all of their happy contents. I'm going to push that back until August...and hope that I can keep weird school dreams at bay! I am on the hunt for good ways to store and organize borders. I didn't realize I had so many that I've accumulated over my 3 years. I've picked up a bunch of cute ones from Creative Teaching Press and the rest are hand-me-downs from nice teachers. Any great ideas for organizing? Yeah, that kind of really made my day!